What to do when you see an 'insufficient services' error in Connect. When provisioning a new switch port, or activating a new telephone extension, you will need to ensure that the client has adequate services to do so. If you have not purchased enough services you will receive a warning message in Connect when trying to provision new services. In either scenario above, you will need to go to the Services section on the Clients page to establish what services the client is actually paying for, and then cross check that with the number of extensions and switch ports already active. Click here to learn more about managing services and how to access this page. If you are unsure of the number of switch ports the client has already been assigned, you can return to the Switches page, and select the client name from the drop down list. Click here to learn more about switch management. The ports on this switch, already assigned to the client will begin to flash. 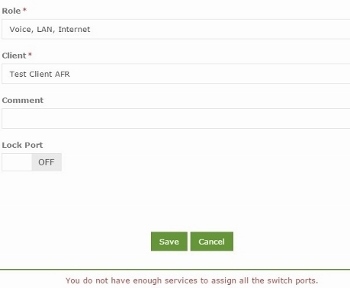 You can also select 'For Client' from the drop down list on the left, to get a comprehensive list of all ports on all switches, currently assigned to the client. In this example, you can see from the screenshots above, that the client is paying for two standard (phone and internet services), has two switch ports already assigned to them, and has two active extensions ( and a main number). Therefore, in order to enable any additional phone numbers or switch ports, more services are required. Similarly, when removing services, you will need to ensure that the client has enough remaining services to cover the number of ports and phone numbers assigned to them. 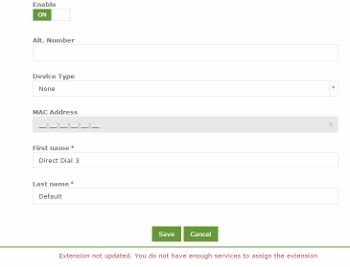 Again, Connect will throw any error, and you should follow the steps outlined above to make sure the services, phone numbers and ports tally up. It's very important to check both the active phone numbers and switch ports.